Since I've been essentially doing my runs in the dark these days, I was excited to be able to try Panther Vision's Power Cap. Sadly, I haven't really run with a lot of lighting products (I wear reflective stuff, though! ), probably because I didn't used to run in those kind of conditions, and when I did, it was on well-lit streets. I haven't rolled my ankle since my first run out, but I often wish for more lighting during some parts of my run. 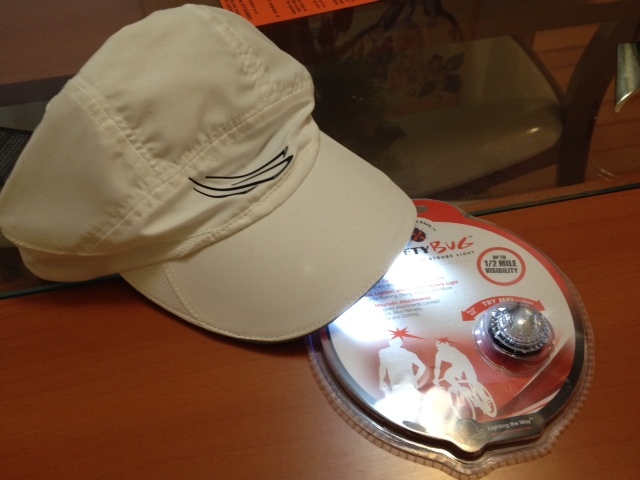 Included with the cap was an LED light that can be pinned or attached magnetically to clothing. I found the whole thing to be a little heavy for some of my thinner running clothes, but placed strategically, it's always good to be visible with a noticeable red color. Now for my review of the cap itself. I was sent a women's size, so it did not want to stay on my head. I'd put it on, make it tighter, etc., but within 10 feet, it'd start slipping off. The "head" box just was too shallow to accommodate my large-ish head. Other than that, it didn't feel heavy, and the light was a soft white light that made me feel more sure-footed during the darker parts of my run. All you have to do is squeeze a small area of the "bill" of the cap, and you're good to go! The first concern I had when I saw the cap was washing, though the tag specifically said it's fully washable once the batteries are removed. The battery pack is located toward the back of the cap, and the batteries pop out pretty easily. I just followed the typical procedure that I use for washing my hats -- toss in cool wash, and don't let it get in the dryer! It's definitely nice to have a clean cap instead of something that wouldn't be able to be washed! FTC Disclaimer: I was provided a sample product but was not otherwise compensated to write a review. Looks super cool! When training through the winters in Michigan I would have loved something like this.